Updated October 28th, 2015: The County has issued the reclamation plan for the Breezy Point mine. Click HERE to read it — pay special attention to the conditions that they have specified. … and here’s the memo I wrote requesting that they deny the permit. All of the slope issues that I’m complaining about still exist, so we still have some work to do peepul. There is a fundamental and substantive error in the analysis that underlies the reclamation plan proposed for the Breezy Point mine. The first part of this memo will demonstrate this error and explain why the plan as written must be rejected. We follow that analysis with detailed comments describing additional deficiencies in the plan. At no time should these comments be viewed as support for the CUP Application (which is included in the reclamation plan by attachment). 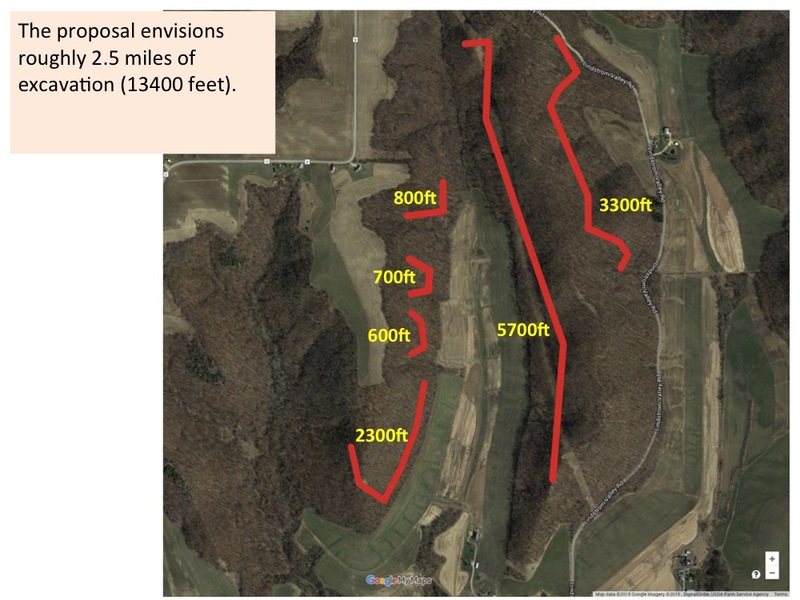 Replacing 30 acres of rare Driftless Area bluff-prairie and oak-savanna habitat with low-diversity prairie plantings described as a “bluff trail” that will not be visible to anyone except the property owners is completely incompatible with surrounding land use and should not be permitted. 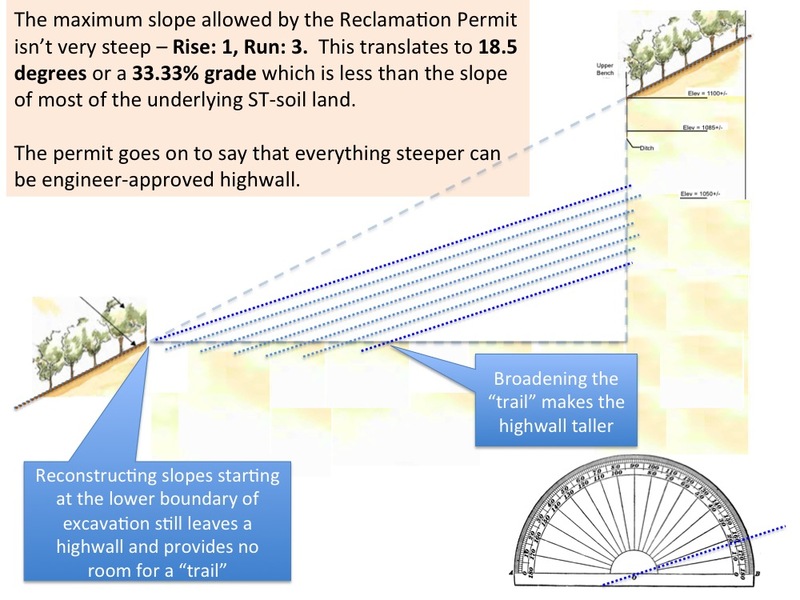 In addition, this plan proposes at least 1.25 miles of sheer 100+ foot rock faces in the Steep Soils district that will be visible for miles. 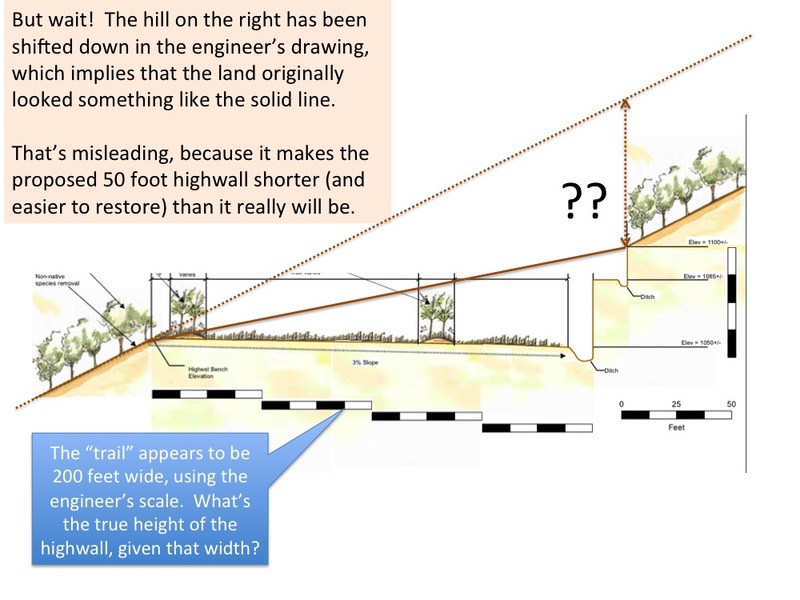 The reclamation plan provides drawings that imply that the vertical rock faces behind the trail will total no more than 50 feet – a 35-foot lower section and a 15-foot section that is set back by 15 feet. The following diagrams demonstrate that this is an error and show that the vertical rock faces will more than likely range from 70 to 130 feet high or more, depending on trail width and terrain. We presume this is merely a mistake on the part of the consultants preparing the plan and not a deliberate attempt to mislead county citizens and decision makers. Here is the fundamental error. 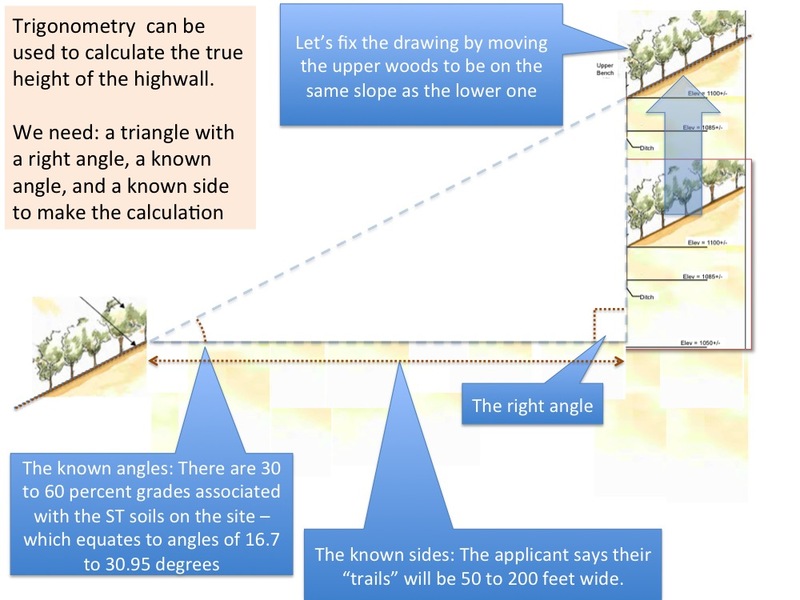 Trail designers did not account for the actual contour of the land when describing the rock face. Rather, they shifted that contour back so that in all cases the height of the rock face is the same 35 plus 15 feet. We used basic trigonometry to demonstrate that error on the following pages. An additional error compounds the first. 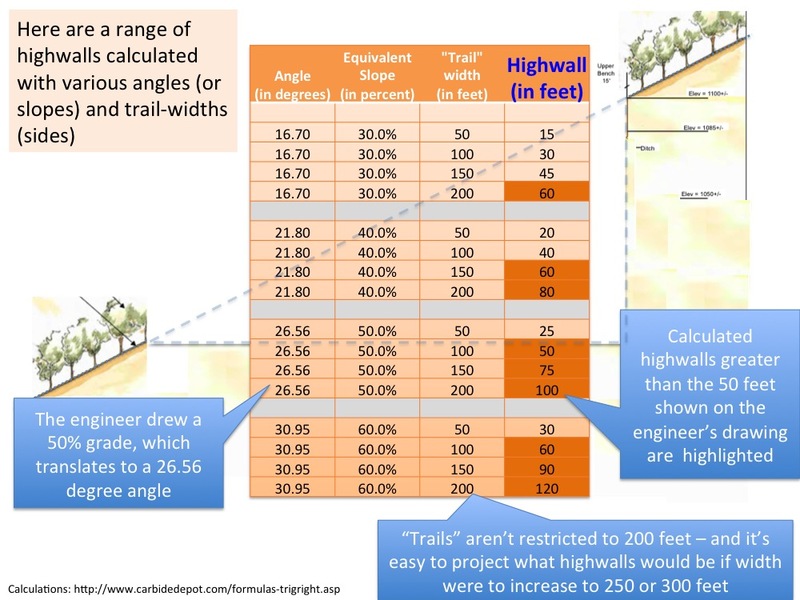 Trail designers used a constant 28% grade to describe the underlying terrain. This is wrong in two ways. 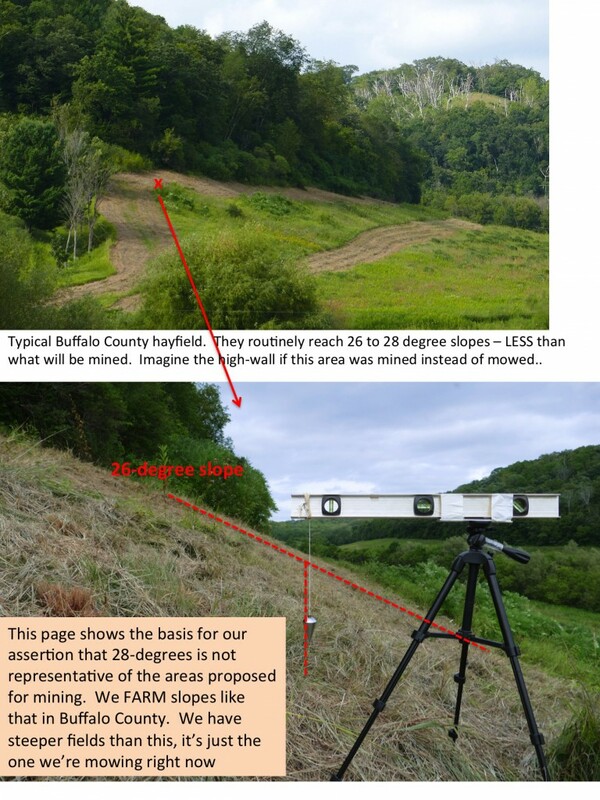 A 28% grade is more typical on the “high side” of pastures in the centers of Driftless Area valleys as we will demonstrate with pictures of a pasture from our farm. Secondly, the contours of the land are not a constant slope. Slopes generally increase closer to the ridge-tops where mining will take place. 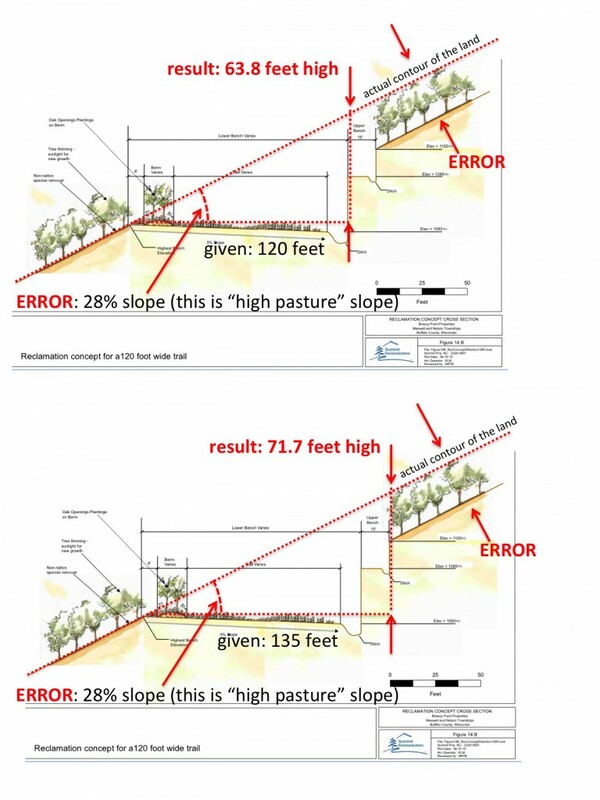 The final error is the presumption that sheer vertical rock-faces can be successfully planted. We will use pictures of a very small rock face on our property to demonstrate that plants don’t grow in vertical bare rock; they grow in horizontal terraces, nooks and crannies. 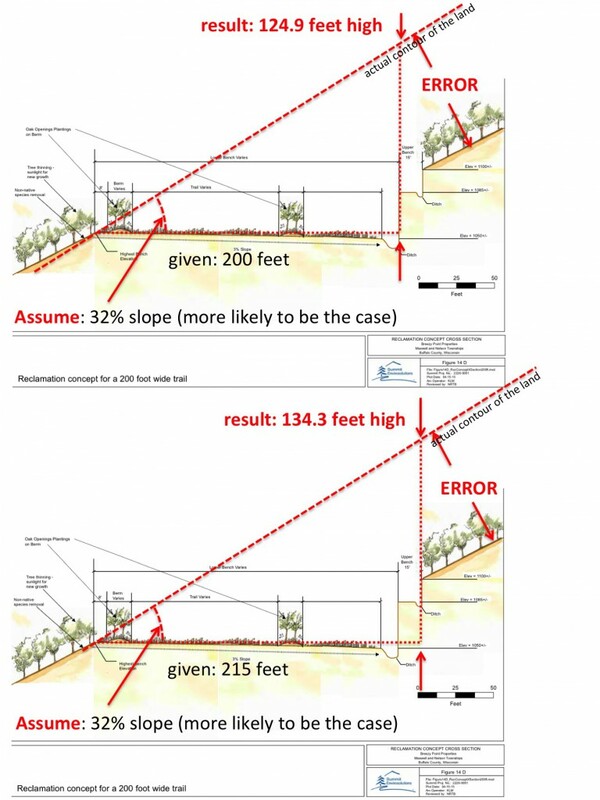 Yet this design specifies two sheer vertical rock faces, with no slope whatsoever, behind the mined area. Taken together, this means that the rock face will be much higher than is implied, and it will be bare. For this reason, the plan must be denied and these errors corrected before proceeding with the application process. We request a written justification from the Land Conservation office if this reclamation is approved as drafted. The reclamation plan states on Page 1, “the current and projected price of the sand beneath the mined area makes this project possible.” We suggest that those words may have been written some time ago. The need for proper financial assurances for this project is crucial and that without them, there is substantial risk that this plan will not be completed. 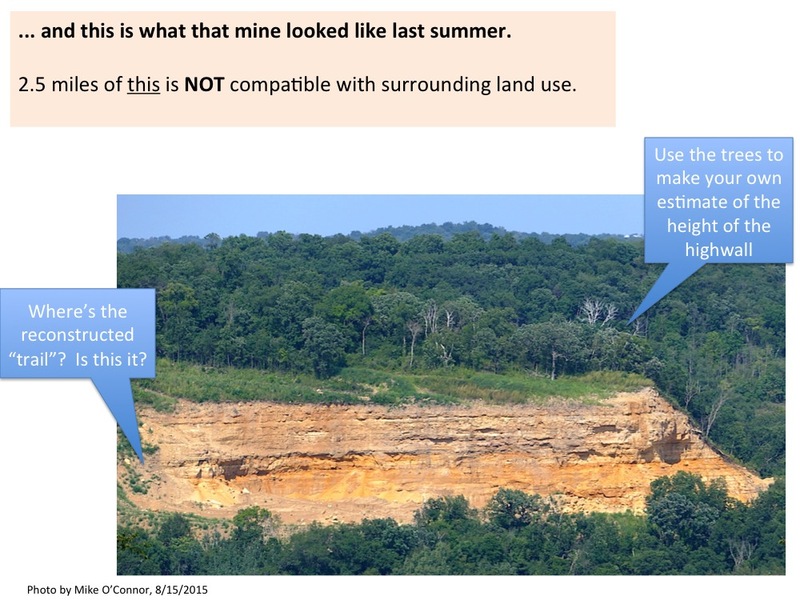 Most of the permitted frac sand mines in Buffalo County are either in bankruptcy or shut down, primarily due to the fact that there is no market for commodity sand that carries a substantial non value added trucking cost penalty. Buffalo County citizens and residents are already facing the prospect of unreclaimed mines. The most recent example is the Bechel mine in Pepin County, which recently closed and left the township with a crushing financial burden. Given the high probability that this mine will also fail financially, the financial assurances for this project need to be ironclad and funded up front. “Pay as you go” financial-assurance instruments, as provided for by DNR regulations, must not be allowed. Change the goal of restoration from “pre-settlement vegetation” to “pre-settlement habitat.” Pre-settlement vegetation can be accomplished by simply planting a small number of species that were here in pre-settlement times. By changing the focus to “habitat”, we recognize that the goal is to reconstruct a rare ecosystem that has been destroyed. A list of existing (pre-restoration) species that have been identified in the bluff prairies and savannas of our nearby farm is included in Appendix A. It is very likely that a survey of the Breezy Point site would find many, if not all, of these species in the degraded savanna that is being proposed for mining. Appendix B is a much more representative sampling of the DNR “Wisconsin Natural Heritage Working List” than the one provided by the applicant. Note that we have found many of those species on our farm a few miles away. Also note that we have found those species in places very similar to the ones that are proposed for destruction by this mining project. Once again, note that the applicant proposes to destroy rare, unique, diverse habitat that may support well over 100 species of plants and the soil that underlies them. This is why we request changing the project goal from merely planting a few plants that existed here to attempting to restore a diverse habitat that roughly approximates that which is being destroyed. 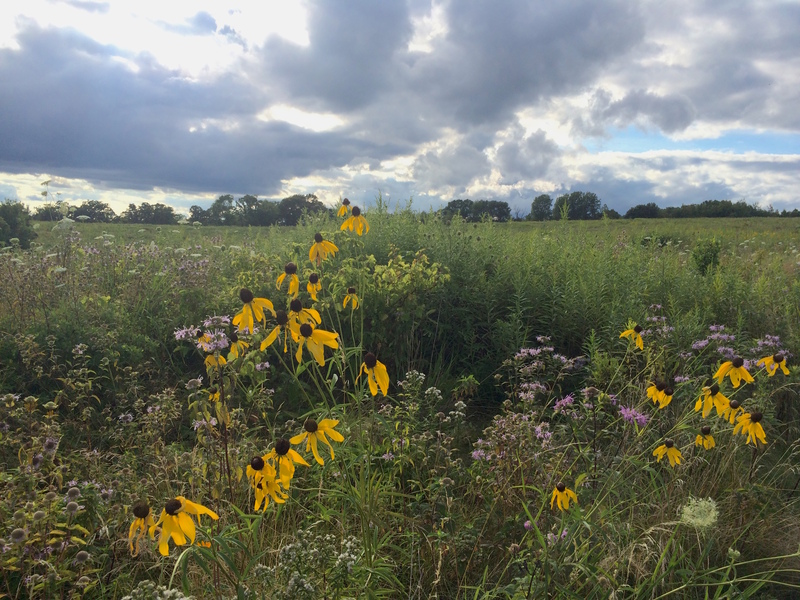 These comments are derived from lessons we’ve learned from the 500-acre native habitat restoration and reconstruction project we are doing on our nearby farm. 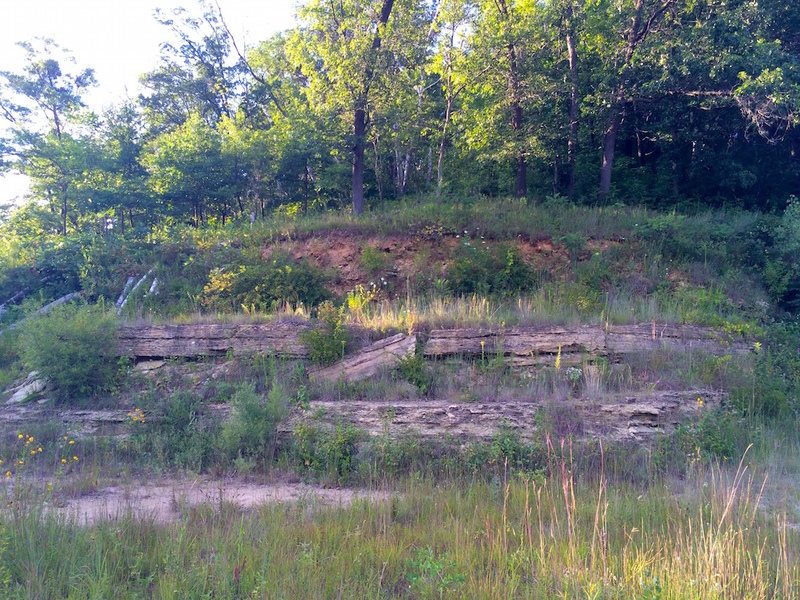 Our land shares many of the same featuresof the land that is being proposed for mining – degraded savanna woodlands, bluff prairie points, wetlands, etc. While these suggestions will not result in habitat quality comparable to that which is being destroyed, the result will at least be better than the office-park landscaping that is being proposed. Increase the diversity and density of the plantings to improve the probability of establishing the plant species that are found in comparable environments in the county. The reclamation plan specifies mixes according to NRCS Critical Planting Code 342 and Wisconsin Agronomy Technical note 5. These mixes are in no way representative of the habitat that is being destroyed by mining Driftless Area bluff prairies and savannas found in Buffalo County. Appendix 3 is an example of the seed mix we used when “reconstructing” prairies by planting into old crop fields. Here is a photo of the field that was planted using this mix – 8 years after planting. Note that while there are many prairie plants, there are still invasive plants that we need to manage. – Increase the density of plantings from 60 seeds per square foot to a minimum of 80 seeds per square foot. 100-120 seeds per square foot would be preferable given the budget resources available. Heavy-grass mixes like the one proposed will result in a prairie with very few forbs because the grasses are more aggressive and will crowd out the slower-developing forbs. Again, roadside and office-park erosion-control plantings that are heavy on grass are a fine thing. But Buffalo County savannas are known for the predominance of forbs and the mix that is proposed in no way resembles the diversity of the plants being destroyed. – Increase the number of forbs species being planted, again along the lines of the mix that we used on this prairie. – Use local seeds (originating no more than 75 miles from the site, preferably within 25 miles of the site). The high wall must be graded and terraced, rather than vertical, in order to provide footholds for plantings. 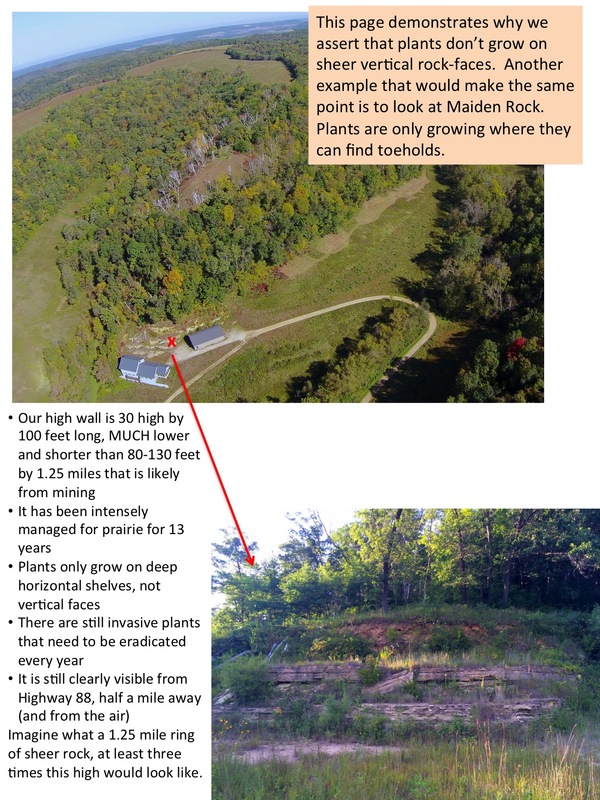 We planted this 30-foot high post construction cliff-face about 15 years ago on our property. Note that the vertical portions of the cliff are still bare after all that time. 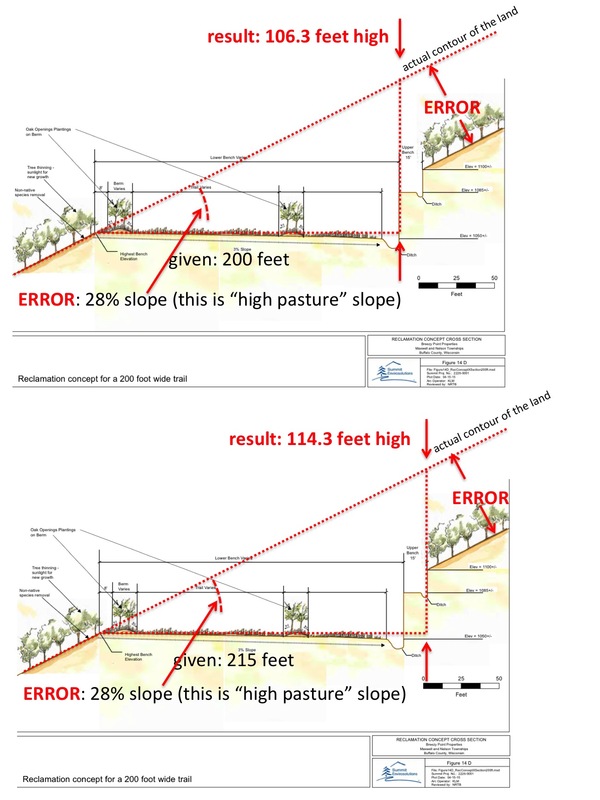 This is why the proposal to leave a sheer vertical high wall behind the mined area is unacceptable. A 1.25-mile long vertical bare-rock scar on the landscape, visible for miles around, will never heal no matter how many seeds are planted on it. The high wall must have slope and terraces where cliff-plantings can take hold. This photo shows that the vast majority of the plants are finding flat places to take root. Do not use topsoil in areas of native plantings. 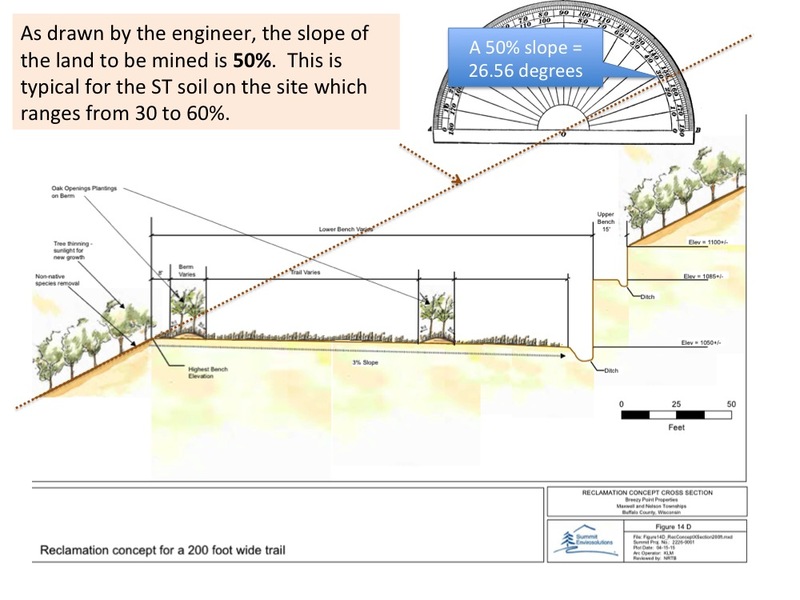 The proposed reclamation plan mentions that topsoil that is removed during mining operations will not be used in areas of native plantings. We commend this approach. The degraded savanna soil now has a large seed bank of invasive species that will completely dominate the plantings if used in native-habitat restoration areas. This is exacerbated because the soil will be radically disturbed, which encourages the growth of weeds. Using this disturbed soil as the basis for native plantings will dramatically reduce the quality of the restoration and increase the difficulty of controlling invasive plants to near impossible. 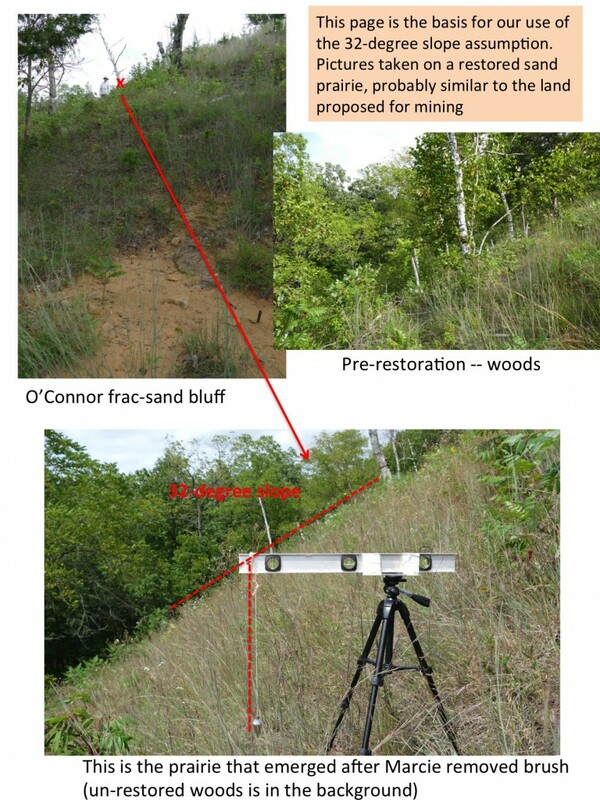 Rather, use removed topsoil in other areas of the restoration and use near-sterile overburden and non-specification sand for the native-habitat restoration area. Dramatically extend the period of invasive-species control. A minimum of 10 years should be required, 15 is preferred, in order for native species to be able to withstand encroachment by invaders. Provide resources for periodic review and repair for an additional 5 to 15 years. An independent contractor, with a proven track record of native habitat restoration, should be hired to perform the restoration. Prairie Restorations (http://www.prairieresto.com/) is an example of such a company. Native habitat restoration is a skill claimed by many and mastered by few — thus the need for a proven record of accomplishment of success at such restorations. Specify that an annual audit of restoration activities be performed by independent organization (not the mine operator, nor the restoration contractor) and that the recommendations made during this audit are binding on the operator and the contractor. These are species found in prairies and savannas of western Wisconsin, that are included by the Wisconsin DNR in the Wisconsin Natural Heritage Working List – a list of species known or suspected to be rare in the state. The DNR Natural Heritage Inventory also has a watch list – of species they’re concerned about that have experienced a decline numbers either in the state or in their entire range. This proposal comes out of a broad discussion involving many people in the County over the last several years. It boils down to two conflicting visions of the future of the Great River Road corridor in Buffalo County. Proponents of this amendment to the county Zoning ordinance seek to preserve and enhance the unique natural and economic resource that exists along the Mississippi River; opponents would like to see that region become an industrial and transportation zone. This ordinance would amend the Buffalo County Zoning ordinance to add another overlay district. This overlay addresses land use within unincorporated parts of the county that surround The Great River Road. Note: this overlay would not apply to incorporated towns in the district. What is the definition of “truck trip”? A truck trip is “Trucks with a gross vehicle weight rating, or actual gross weight, in excess of 50,000 pounds traveling on the GRR/NSB in Buffalo County.” Or twenty five 50,000-pound loads a day. What are some of the goals of this ordinance? 1. Preserve an attractive, cohesive and safe environment for citizens and visitors. 2. Safeguard the natural and historic heritage of the region by preventing the despoliation of scenic views. 7. Implement the goals of city and townships along the GRR/NSB by protecting the ability of the citizens and tourists to safely use and capitalize on the county’s natural tourist attractions such as the many Wildlife Areas and Refuges for hiking, bird watching, canoeing, hunting and fishing etc. What’s the Great River Road, why protect it? State Hwy 35 was designated in 1938 by President Roosevelt as part of The Great River Road, managed by the Mississippi River Parkway Commission (MRPC). Thus, this amendment not only protects the segment of the Great River Road in Buffalo County, but also impacts the rest of this 250-mile route in Wisconsin and all 33 of the river towns located along its route. What other issues caused by truck traffic is the ordinance designed to address? Due to the size constraints (caused by the Mississippi River on one side and the bluffs on the other) city parking in Alma and Fountain City is extremely tight, other than parallel parking on the Great River Road and a few parking spots on side streets. Most residential and commercial sites do not have an area for parking other than on the street. Difficulty in parallel parking is already a concern and a massive increase in truck traffic will only make these safety hazards worse. 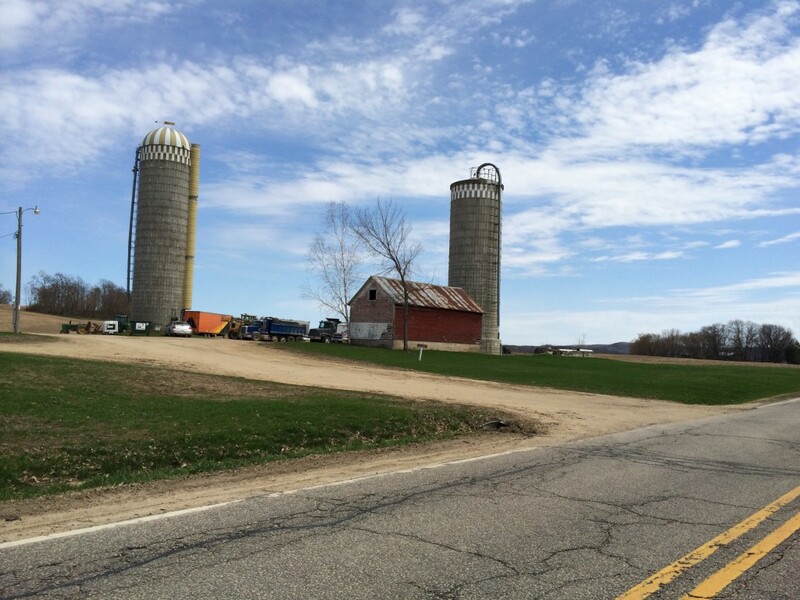 Farmland and communities are all hurt by increased truck traffic. But the impact of a high volume industrial haul route that passes directly through several of the county’s oldest main street communities (Nelson, Alma and Fountain City) will be especially significant. These tightly packed communities will feel the brunt of loss of property value, and the finances of local governments will suffer (through loss of tax revenue) as a result. Residents of river communities will experience many adverse impacts living 15 feet away from high volume diesel truck traffic; substantial traffic increases, noise pollution and exhaust pollution to name just a few. Quality of life for thousands of county citizens will diminish dramatically. Public utilities for the City of Alma are buried under the Great River Road, including community water lines and sanitary & storm sewers constructed years ago. Wear and tear on this road by heavy truck traffic will hasten the need to replace the entire city’s utility infrastructure. What about small businesses that might have lots of delivery trucks (UPS, FedEx and the like), would this be a problem? No. Trips by those trucks would not be restricted, they are much smaller than 50,000 pounds gross weight limit proposed by this ordinance. What about existing businesses, will they be required to adhere to the 50 truck-trip limit? This overlay will only come into play during applications for new zoning permits. Therefore, an existing person or business that already has a permit will not be subject to the limit. Doesn’t this amendment discriminate against one industry – sand mining? No. Sand mining is not singled out. This amendment will block any business or person who requests a zoning permit within the overlay district for a land use that will generate more than fifty 50,000-pound truck trips a day. Doesn’t this amendment put Buffalo County into the role of saying who can conduct what kind of business and where? 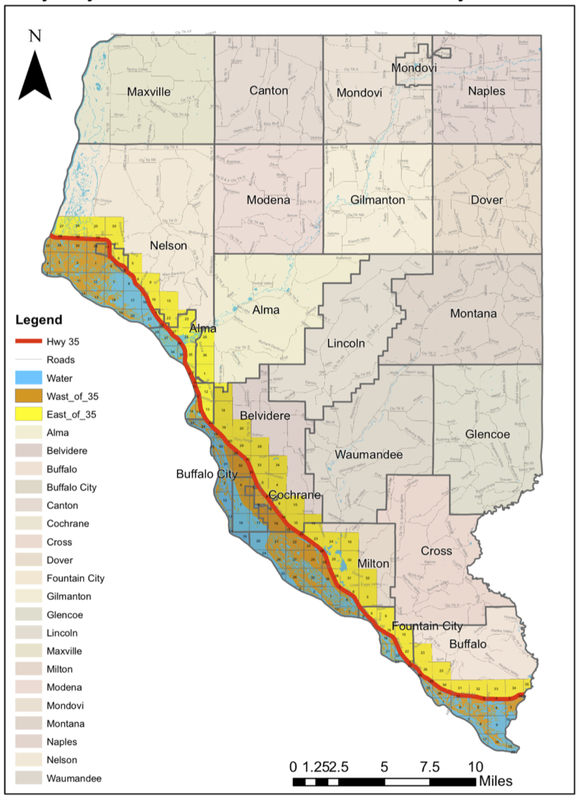 Buffalo County, along with just about every other county and local government, is already using zoning law to place limits on what type of activity can happen in various places within its borders. There are all sorts of good reasons for this, mostly having to do with protecting the health, safety and welfare of its citizens. What about public-works projects like hauling dredge sand out of the Mississippi, will this ordinance prevent that? It might, if that project generated more that fifty 50,000-pound truck trips a day and required a zoning or conditional-use permit to dispose of material on land in the overlay district. However there may also be alternative ways to transport dredge sand that might work better for everybody. The DOT says that Buffalo County cannot regulate the traffic on a State Highway. Are we setting ourselves up for a lawsuit? This amendment doesn’t regulate traffic on State Highway 35. It places limits on land use in a corridor that sits on either side of that highway, something that is within the authority of the County. The County Board is considering an an ordinance amending the County Zoning ordinance to add an overlay that would protect the Great River Road. Here’s a quick post to describe the amendment. As you’ll see, there are a lot of wonderful features of the road that this will protect. Click HERE for a PDF version of this blog post that you can print as a brochure and hand out to your friends. And click HERE for the notice of the upcoming public hearing at 6pm on 15-October, which includes a copy of the ordinance. What does this amendment do? 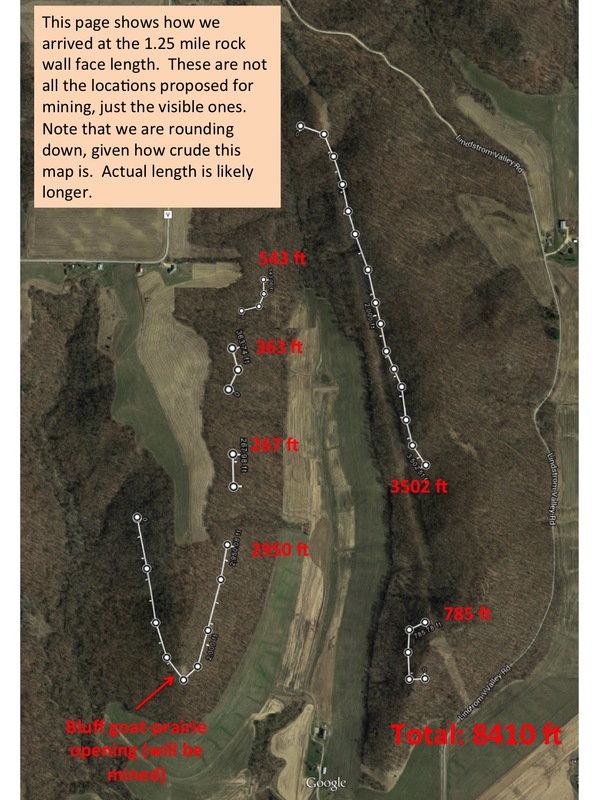 This amendment to add an overlay to the Zoning Ordinance will establish a new overlay (in addition to the existing Steep Soils Overlay) that restricts new operations along the Great River Road to no more than 50 truck trips a day. This restriction does not apply to existing operations — none of which exceed this number of truck trips, based on a poll conducted by the Buffalo County Zoning Committee. Create a more attractive, cohesive and safe environment for citizens and visitors. Safeguard the heritage by preventing the despoliation of scenic views. Implement the goals of city and townships along the GRR/NSB by protecting the ability of the citizens and tourists to safely use and capitalize on the county’s natural tourist attractions such as the many Wildlife Areas and Refuges for hiking, bird watching, canoeing, hunting and fishing etc. CLUP are on file for Alma, Buffalo, Belvidere, and Milton townships as well as for the cities of Nelson, Alma and Cochrane. These plans support enhancements and protections of the scenic values. Surveys in the LUP’s overwhelmingly said that people live in Buffalo County because of the natural beauty, small town atmosphere and agricultural base and that economic development must be balanced with these characteristics. The Village of Cochrane’s CLUP describes concerns about the possibility of any rail load out on the BNSF rail. Nelson Township’s survey reveals that most are opposed to industrial development. The Township of Alma wants to promote tourism and protect the natural beauty. Others raise concerns about building on bluff tops, prime farmland or in floodplains. Buffalo County should integrate the many state, federal, county and city, parks and wildlife areas that attract visitors and citizens into a plan for economic development. A central education/ recreation center / county park along the Great River Road that draws people to the area and shows them what animals, birds and fish live here. Alma has land available for a park that was never built and land that could include a hiking trail to the bluff that was never developed. The county has plans for a bike trail connecting Buffalo County to the Great River State Trail that have been languishing for 10 years. Many of the natural attractions are not identified for visitors and even citizens do not know about them. Parking lots, trails , boat launches and camping areas are needed to make them accessible. The Buffalo County Outdoor Recreation Plan supports the need of a Great River Road Recreation and Tourism overlay district. This plan contains valuable information about the goals and objectives of the County and how the plan should / could provide a single source for a county wide inventory of existing outdoor recreation facilities and opportunities. Consider the impact of the local economy of the many visitors and tourists in the area that utilize the county and municipal outdoor recreation facilities. Tourism: Recognize that Buffalo has attracted and will continue to attract tourists for a wide variety of activities that include, biking, hiking, fishing, hunting, canoeing, birding etc. This designation means that the road, and its associated corridors, has exceptionally high quality or uniqueness in at least one of six different intrinsic qualities: Archeological, Cultural, Historic, Natural, Recreational or Scenic. Buffalo County’s part of the GRR-NSB has all 6 of these qualities (see below for some examples). State Hwy 35 was Wisconsin’s first State Scenic Byway. The State of Wisconsin created the program “to recognize state highways that offer travelers numerous scenic and/or historical attributes whose promotion can serve to boost a region’s attractiveness as a tourist destination.” County officials may think that they are only impacting this State Scenic Byway in Buffalo County, but our section is located in the middle of this 250-mile route in Wisconsin and could impact all 33 river towns located along its route. Buffalo County is in the beautiful “Driftless Area” which is unique in the world. It’s called that because the ice didn’t “drift” over this area. The historic Twin Bluffs in Nelson has been preserved through the Nature Conservancy. The Wisconsin Historical Society recognizes it as an important site once used by American Indians. There is a rich heritage of immigrants along the river settling Alma, Fountain City, and Nelson. A fine place to learn about this is the Prairie Moon Museum in Milton Township. The Great River Road runs directly through the City of Alma’s Main Street, a National Historic District, first settled in 1848 as part of the logging boom in an area called Beef Slough. In 1982, 346 acres and over 200 buildings were protected as important when included in the designation of the City of Alma as a National Historic District. Several buildings are individually protected as well and listed on the National Register of Historic Places. Most of these historic buildings are just feet from State Hwy 35. Fountain City is the oldest settlement in Buffalo County with an important home on the Historic Register. The Fugina House was built in 1916 in the Prairie Style made popular by Frank Lloyd Wright. Rivers and wetlands and bluffs make up the unique “Driftless Area” habitat of the County. Eagle Bluff in Fountain City is the tallest bluff on the Mississippi. Buena Vista Park at 500 feet is the largest natural balcony over the Mississippi and is widely known as one of the best views along the GRR. Due to the size constraints caused by the Mississippi River on one side and the bluffs on the other, in Alma and Fountain City, there is no room for city parking other than parallel and a few parking spots on side streets. Most residential and commercial sites do not have an area for parking other than on the street. Difficulty in parallel parking is already a concern. Farmland and communities are all negatively impacted by increased truck traffic but the impact of a haul route that passes directly through two of the county’s oldest main street communities, Alma & Fountain City is significant. These centralized communities will be negatively impacted by loss of property value and local government will experience negative financial impacts with the loss of property value. Residents of these cities will experience many adverse impacts living 15 feet away from State Hwy 35; substantial traffic increases, noise pollution and exhaust pollution are just a few. Quality of life for thousands of county citizens will diminish dramatically. Property value will decrease. Public utilities for the City of Alma are buried under State Hwy 35, including community water lines and sanitary & storm sewers constructed years ago. Wear and tear on this road by heavy truck traffic will result in eventual damage to the entire city’s utility infrastructure. Allowing such a wide variety of haul routes makes it impossible to assess the impact of this mine on public health, safety and welfare. Expanding the length of the permit from its original 5 years to 20 years is unnecessary. Nothing prevents Klevgard from completing his plan under a regime of 5-year renewals. Expanding the length of the permit from its original 5 years to 20 years is irresponsible. Buffalo County needs periodic reviews to protect public health and safety and ensure that this marginal operator complies with his CUP. The application materials have substantial irregularities that should have been addressed before they were even brought to the BOA for consideration. The applicant is requesting two additional options for hauling. Approving this application will mean that Buffalo County residents along all three haul routes will spend the next 20 years in a state of uncertainty as to whether 125 loads of frac sand will be rolling by their homes and businesses, with the attendant impact on business operations and property value, on any given day. This extreme diversity of routes makes it impossible for Buffalo County to assess the public heath and safety impact of the mine, since at any given moment the trucks might be going in any one of three completely different directions. One of the duties of Buffalo County is to assess the cumulative impact of mine operations on the county. This too will be impossible, again because of the uncertainty of the impact from Mr. Klevgard’s proposed hauling operation on the region. Klevgard appears to be a marginal operator that needs a fair amount of supervision, given that he just barely got the Reclamation Plan approved in time to meet the 2-year start-up window in his CUP. Klevgard is out of compliance with the paved tracking pad and tire-cleaning conditions of his CUP if he has shipped any product. Condition #2 of his CUP states that the tracking pad must be paved at a minimum of 200’ from Highway 88. That condition goes on to state that the paving must be complete prior to any product leaving the site. Here is a picture of the Klevgard operation taken today (May 4, 2014). Mr. Klevgard has also been cited for shipping product without a permit at various times in the past. All of this, taken together, indicates that Mr. Klevgard is an operator who needs a fair amount of adult supervision. Extending the length of time between reviews of his operation from 5 years to 20 is unwise. Nowhere does it say that all the minerals have to be extracted in five years. If Mr. Klevgard needs more time to complete his excavation, he can file for another permit and, if all is going according to plan, it seems likely that it would be approved. Every time Mr. Klevgard has appeared before the BOA his whole pitch has been his innovative small-acreage approach to mining and that the reclamation will be happening in tandem with excavation. Thus, reclamation on the land that has been mined should be complete shortly after excavation is finished. That was the whole point of the presentation that was made to the Board of Adjustments mere months ago. Suddenly this is no longer feasible? What has changed? What is the basis the language “total disregard to the landowner”? Klevgard is the landowner. This language implies that somebody else is writing it. But no other name appears on the application? What are the issues that are being disregarded? This language raises more questions than provide answers. This request is an unwarranted attempt to make life easier for Klevgard (and unnamed others) at the expense of the rest of the citizens of Buffalo County and the region. Mr. Bublitz of the Zoning office provided me with a signature page dated April 29th, a letter of justification dated April 30th, and a letter from the Gilmanton Town Chairman dated April 28th. The Notice of Public Hearing was published April 24 and May 1, but the hearing is being held May 6th. The public (and the BOA) has had less than a week to review material documents prior to the hearing. The Public Hearing is less than a week later than the second publication date of the notice. It is not clear whether the letter from the town of Gilmanton is the result of a properly-noticed town meeting or just a personal letter from the town Chairman, Mr. Meier. I inspected that knoll on May 4th and found minimal evidence that the knoll has been removed. Since Klevgard has included the letter in his application (and thus made it part of the record for you to consider in your deliberations), I hope the BOA will visit that knoll as part of the site visit and form your own view as to whether that condition has been met. The application form states that Mr. Klevgard is the owner. The application form does not refer to Aaron Keopple or Advanced Sand and Proppants. However, the letter of justification indicates that ASP owns the mineral rights to the sand that will be mined, and will be “assisting” Mr. Klevgard. Since the operational expertise (drilling, blasting, quarry operation, etc.) and mineral rights reside with Mr. Keopple and ASP, aren’t they really the operator of the mine? Shouldn’t they be listed on the application form, and be held accountable for the success or failure of this mine, along with Mr. Klevgard? Approving an application with all these irregularities establishes a terrible precedent for other mine operators to follow. It sends a signal that applications can be out of compliance with public notice requirements, and downright misleading, without risking any adverse consequences. Approving an application that introduces this much uncertainty over haul routes does an enormous disservice to property and business owners of Buffalo County and the region that surrounds it. Not to mention the inability to assess the health and safety impacts of a constantly changing haul route through one of Buffalo County’s largest towns. 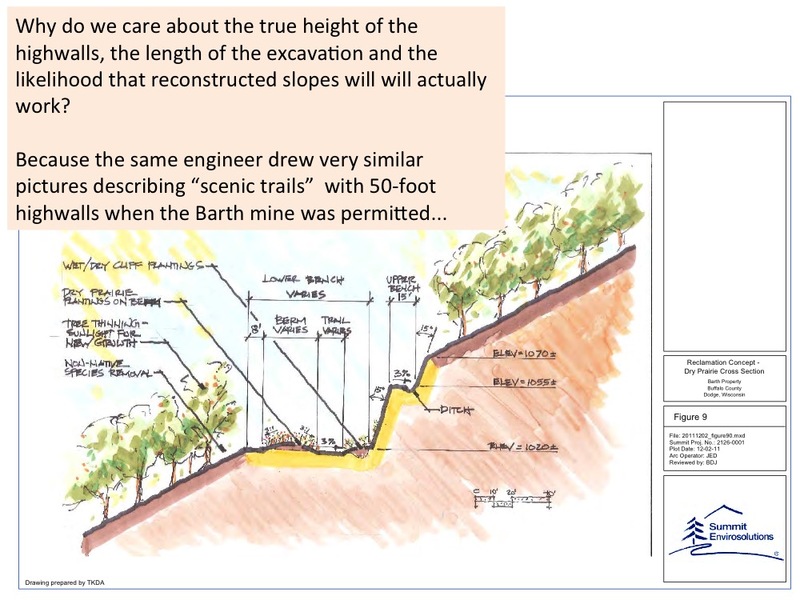 Approving an application that extends the time between opportunities for reviews and course corrections from 5 years to 20 is inconsistent with previous depictions of this mine as an innovative “small footprint” operation. It’s also a terrible idea given the track record of this applicant.